Carl Darlington has said he had offers from other clubs before deciding to return to Wrexham's coaching team. Darlington was part of Wrexham's coaching staff under Kevin Wilkin and was briefly caretaker manager before leaving in May 2015. 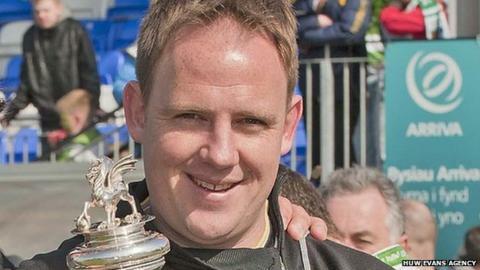 He re-joined Welsh Premier League champions New Saints in December 2015 but left his role earlier this month. "I had different offers on the table to go to different places," Darlington said. "I've been speaking to Dean Keates since he had the job, and it (the challenge) excited me. "It's a different challenge to when I first went to Wrexham because we're starting from scratch." Darlington will combine his role at Wrexham with his role as head of coach education for the Welsh Football Trust. He said continuing with the Trust was was one of the main reasons why he accepted Wrexham's offer. "One Football League club was interested, but I wasn't prepared to give up my role with the FAW Trust," Darlington added. "I love developing Welsh coaches and Welsh players. "The other opportunities I had were other clubs in the National League. "But when National League teams come asking then I was only going to go to Wrexham." Manager Keates released nine players following a disappointing season which saw the Dragons finish 13th in the National League. Midfielders Mark Carrington and Paul Rutherford and goalkeeper Chris Dunn have signed new deals while youngster Leo Smith has signed his first professional contract. James Hurst became Wrexham's first signing of the close season as Keates rebuilds the squad. "We can bring the players that we want in," Darlington added. "We haven't got to inherit any players that we don't want so we'll bring a brand new squad together. "We will get that blend right and we will get the balance right. "But bringing 18 new players into the club, not knowing each other and not knowing the dynamics, the balance and how things work and operate, is going to take a while. "We want them to get on to that Racecourse and grow with the fans."